Offer your feathered friends an ornate and beautiful feeding spot with this Deluxe Azalea Bird Feeder and Decorative Mounting Post Package. This fantastic unit includes a generous bird feeder, along with a lovely vinyl post for displaying it. The Wing and A Prayer Azalea Bird Feeder easily holds 2.2 quarts of seed in the center, plastic reservoir, which exits onto the hexagonal base for several birds to enjoy it. Add suet, fruit, or other seed to the platform to entice a wider variety of birds to visit. Its significant, copper colored metal roof protects the seed from the elements, and the white finial lifts for refilling the reservoir. Place this impressive feeder on the included New England Decorative Mounting Post using its integrated collar. The feeder snugly rests on this striking post, and its white, vinyl construction blends with the frame for a cohesive effect. A flared base and trim at the top of the post enhance its classic look, and its 60" height places the feeder at a wonderful display spot. Both the vinyl body of the post and the PVC construction on the feeder create lasting pieces, able to withstand use outdoors for many seasons. 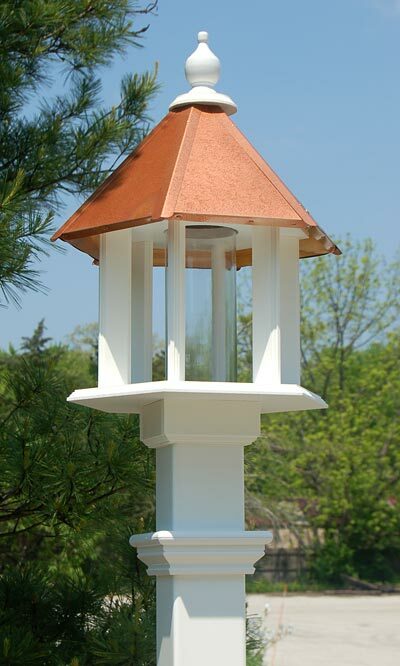 An included, galvanized steel anchor keeps the post stable in your landscaping, and the galvanized metal roof of the feeder retains its copper colored finish for many seasons. Create an elegant feeding spot in your bird garden with this Deluxe Azalea Bird Feeder and Decorative Mounting Post Package. Feeder made in the USA. Shipping Cost: To see the shipping cost for an item, click "order item" to add it to your cart. For expedited or international shipping costs, you must begin checkout and enter address information. Droll Yankees Bird Feeder Brush, 24"
Black Oil Sunflower Seed, 5 lbs. Wild Bird Seed Mix, Cardinal Blend, 40 lbs. BestNest Mixed Seed Sampler Package, 50 lbs. Peanuts in the Shell, 5 lbs. Raw Peanut Splits, 5 lbs. Medium Sunflower Chips, 5 lbs.